Ahh Sugar Chicken. A band I am 90% certain I have albums by. Also the game I played on Tuesday. We are both currently slightly addicted to Pret A Manger popcorn bars. These are bars made ofpopcorn, white chocolate, Rice Krispies and love. Not much love, they are a corporate snack after all, but some. So, me being me, I decided to make them. And me being me I decided to go the long way round. BRAIN: MAKE SOME! THAT’S WAY MORE PUNK! 4 tablespoons of water is like firing an arrow at a death metal concert. It’ll definitely go somewhere but there’s way too much going on for anyone to notice it or for it to do any good. So, employing the tried and tested culinary technique of ‘a sploosh’, I added some more water, melted my sugar and went about my merry way. Here is a fun fact. Unless you add cream of tartar or something similar, sugar will INSTANTLY re- crystallise when you take it off heat. Like, actual chemistry magic level instant. Here is another fun fact. You could weld space shuttles together with it when it does. And the best fun fact of all? Adding heat again totally saves your favorite pan and ensures the first link in your Jacob Marley chain isn’t the world’s most cubist boiled sweet. So after I found that out, things went a little better. 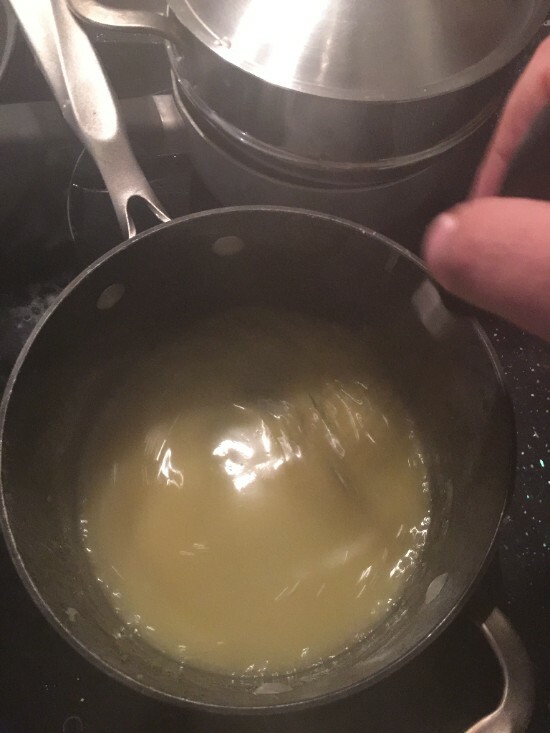 I heated it, brought to to the boil for the set period of time, added the cream and got…slightly beige cream. What I realised was that because I’d added extra order I’d added extra cooking time. Go too soon, and it would be cream in a fancy tie. Go too long? I could grout the house with the lava. Hence, Sugar Chicken. I ended up heating it for about seven minutes and the taste is perfect. The consistency is still sugar brick but it melts down really well. And besides the most important thing is I made caramel, from a standing start, for the first time, and it was pretty good. That was a win I needed this week. And the fact it was a delicious one? All the better.